Normally, I would post the second installment of my Twelve Days of Christmas series. But today, I just can't. At 9:30 am this morning, students in a small school called Sandy Hook, in Newtown, Connecticut arrived at school ready to start the day, eager to learn. But tragedy struck the small school, when a lone gunman entered the school and ended the lives of nearly twenty students, and six staff members. As a teacher, I come to school everyday believing that we will all be safe, that I can keep my students safe.... but today's tragedy is proof that nothing should be taken for granted. We practice codes and drills, in hopes that one day, should a horrific event occur, we would be ready. But I don't know if we can ever really be ready. I wasn't even ready to hear the news of what happened; I cannot even imagine living through such a horrific experience. I consider myself lucky to be able to come home to my loved ones; to be able to hug him and tell him how much I love him. Many families in Newtown will not have such luxuries. My heart aches for all of the families, students, teachers, school staff, and all involved with the horrific scene in Connecticut. While I am not a 'teacher blogger.' 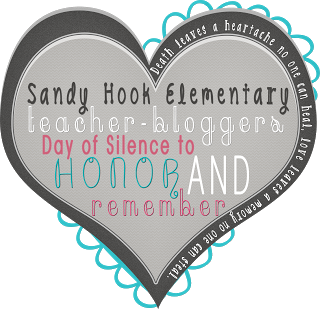 I am a teacher and a blogger, so this Sunday I will be participating in the Day of Silence for Sandy Hook Elementary. Teachers and bloggers all over the blogosphere will be participating by only posting the picture below, and by titling their blog posts "Silence for Sandy Hook Elementary. " If you are a teacher, a blogger, or a friend-of-either, please consider joining me on Sunday and by spreading the word. If nothing else, this horrific tragedy has opened our eyes to realizing and recognizing that every day, every minute, is precious. We must appreciate all we have, but particularly all of those around us. To my readers, those I know, and those I have yet to know, I love you.